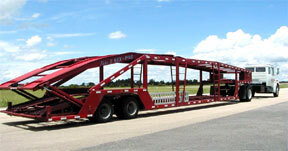 Most of the auto transport companies will use the 10 car carrier to haul you car. The industry standard will be the 8 or 10 car hauler, which is the same trucks used to deliver the new cars to the car dealerships. Because of the length (approx. 75 to 80 feet long) of these trucks, you need to make sure that they will be able to manuever around efficiently in order to pick up your car if it is scheduled for a door-to-door delivery. The height of these trucks are usually approaching 14 feet high. Should I request a 10 car carrier? There is not a definate answer to this question, but unless you have opted for one of the other specialized transport method I would ask the transport company or auto transport broker what equipment my car would be shipped on. Is the 10 car carrier more expensive? This answer should definitely be no. A reliable transport company should have this equipment readily available and should be part of their standard rate. After doing a little research you should be able to find a reliable auto transporter that you feel comfortable with to ship your car. Chances are, you will receive your car in good order at its destination. But for many, peace of mind goes a long way, so if the image of your car on on a flatbed or small truck make your tummy churn, then I would recommend using a company that services with a 8 to 10 car carrier. Remember, let us know how your move went...We want to know!